I’ve always wanted to get the original Snoopy and the Red Baron game but it just hasn’t been in the cards as of yet. Not deterred, I quickly went to Toys R Us and took advantage of their current 60% off all video games sale. It doesn’t get much better than that so I saved a good amount on this Snoopy game. Good thing to since the game is incredibly short but more on that in a bit. The plot revolves around all of the kids going missing so Snoopy decides to find them. He will have to go to a lot of crazy environments to save the kids but as a hero he has no choice but to risk it all. Some of the kids are just hiding in the middle of nowhere while others are actually transformed into giant monsters. No worries, Snoopy has got this. The gameplay is that of your typical 2D platformer. You jump and run past obstacles as you get to the goal. You also find different hats along the way that give you various abilities. One of them lets you climb vines while another has you jump really high. Typically you will want to stick with your usual power up though which is what lets you hover as you go through the air. This can be used to cheese most of the stages and is part of why the game is so quick. It’s not as if this is necessary though since dying would be very hard here. I didn’t manage to lose and you likely won’t as well. When Snoopy is hit you are still given a few seconds to jump up and grab the heart. That’s pretty generous so there is no reason why you can’t simply grab it. Dying is extremely difficult here. The graphics are all fairly cutting edge. I mean, this isn’t exactly Final Fantasy, but the character models are on point and the backgrounds are real nice. Everything looks nice and clear which is good. I can’t say much about the soundtrack though since it is basically nonexistent. I doubt you will be able to recall a single theme by the time it is all over. Perhaps if the game was longer I guess. I’ve been alluding to it long enough. The game only lasts you a little over an hour. That’s considering that I played the final bonus world as well. At most it is an hour and a half which still isn’t great. I can’t imagine buying this for 50 to be honest. Length isn’t really a deciding factor most of the time, but that still has a limit. You at least want a game to last you during a whole trip from Golden Corral to the hotel rather than cutting out halfway. With the game being extremely easy and short that isn’t really a great mix. The average length is apparently 3 hours so maybe I was simply too good. Still, keep this in mind if you’re going to buy this for the going price of 50. It’s simply not worth it at that point. The only replay value here is really to get the Platinum. That won’t take you long, but I guess it will force you to replay all of the stages as you collect everything that there is to collect over there. None of the collectibles are hard to get so it’s just a matter of taking the time to grab them all. Even with the Platinum the game will almost certainly be under 4 hours though so just be prepared for that. This is the kind of game where there really isn’t much more to talk about. I suppose I can say that the bonus world was a pretty good homage to Snoopy’s ongoing dream about fighting the Red Baron. Just like in the TV specials his bullets are invisible so you just see little destruction effects. It makes it a little difficult to tell when the big ships will get destroyed but that’s not really a big deal. They can barely fight back anyway and winning is a piece of cake. As long as you know how to move and shoot you will definitely be fine. Overall, Snoopy’s Grand Adventure is pretty fun. As they always say, it’s about quality over quantity. The game may not be the longest one out there, but the developers did a pretty decent job of making sure that it was good. I also applaud the fact that the game’s trophies are really reasonable as well. It doesn’t really help the replay value’s case, but it is what it is. 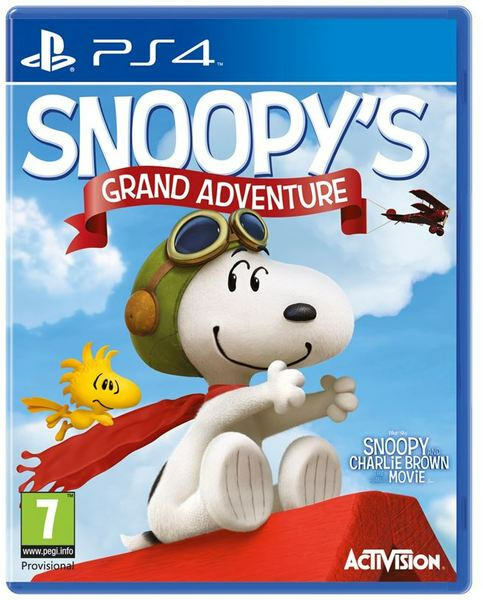 I’m still eager t get the other Snoopy game at some point even if it definitely doesn’t seem all that likely for quite a while. This entry was posted in 6 Star Games, Game Reviews, Games, Reviews and tagged Charlie Brown, Game Review, Peanuts, Review, Sidescroller, Snoopy, Snoopy’s Grand Adventure, Video Game Review by dreager1. Bookmark the permalink. I saw this on clearance at Walmart a while ago, but it was for the Xbox One and not PS4. I just wanted to play it since it looked cute.